London, 4 Dec - On Tuesday, the steelworkers’ strike in Iran entered its 25th day and protesters once again staged a rally in front of the offices of the Khuzestan government and the offices of the governor of Ahvaz, Khuzestan’s capital. They called out “I’m Kaveh the blacksmith — I will not stand for injustice”, a reference to a mythological Iranian figure who led a popular uprising against a cruel foreign ruler and is the de-facto symbol for the fight against tyranny and injustice in Iran. The over 4,000 workers from the Iran National Steel Industrial Group are demanding the payment of long overdue wages, the return of the factory to public ownership, and the resumption of the production line. They’ve gone on strike, held rallies, and now they have taken to the streets to ensure that their demands are held by the public and the authorities. 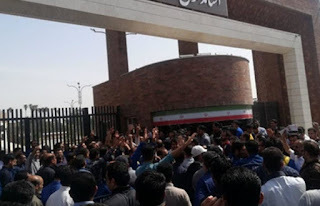 In addition to fighting for their own rights, the steelworkers have voiced support for the striking workers at the Haft-Tappeh sugarcane complex, highlighting the dire situation of the detained sugar refinery workers Esmail Bakhshi and Ali Nejati, who were arrested in late November. These two were not released from jail when other striking workers were and reports are circulating that they are being tortured inside the prison, with Bakhshi even being hospitalised. These protests are taking place as more evidence of widespread embezzlement, theft, and corruption at the top of the Regime emerges on a daily basis. Saeed Leylaz, an advisor to former President Mohammad Khatami, reported that $30 billion has “disappeared” from Iran’s banking system in just the last 10 months. Gholamreza Shariati, governor of Khuzestan province, claimed that the steelworkers had been paid their last two months’ wages and told them to return to work, but the workers refuted this and told him to tell the truth.